The Greater Boston flex market has become the home many of today’s most innovative tenants. The type of tenants that have been filling the flex market are shifting away from generic warehouse use and incorporating elements of office, R&D, manufacturing and product testing. Typically requiring 13’+ clear and large open floor plates these “new economy” tenants include market segments such as robotics, biotech, and autonomous vehicles. Looking forward expect the market to maintain very tight vacancy rates and average rents will continue rising. Additionally, the national trend of rising minimum wages will put a strain on less established tenants to afford flex space with continually increasing rents. Expect national and VC backed tenants to dominate much of the quality flex space in the market moving forward. Greater Boston’s warehouse market has shown tremendous growth during the past 24-36 months, vacancy is near record lows and rents are exceeding previous high-water marks. 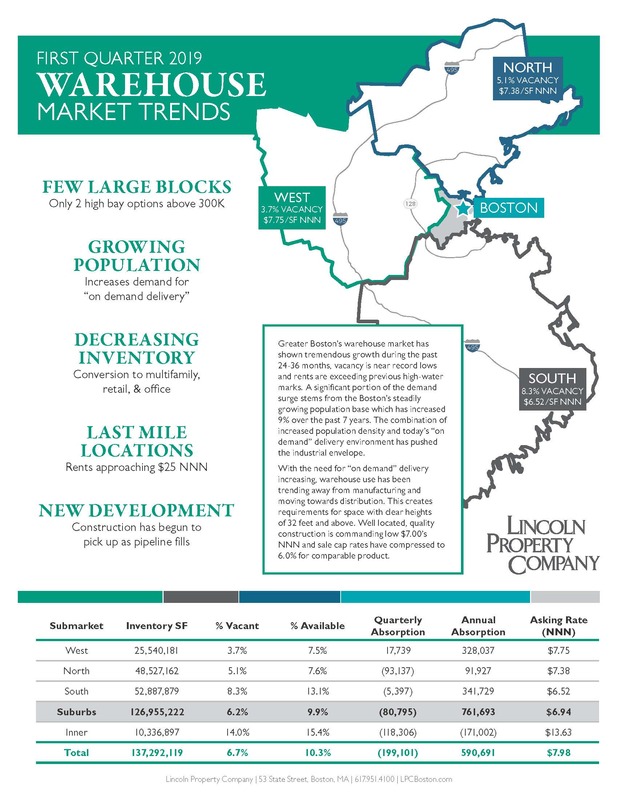 A significant portion of the demand surge stems from the Boston’s steadily growing population base which has increased 9% over the past 7 years. The combination of increased population density and today’s “on demand” delivery environment has pushed the industrial envelope. With the need for “on demand” delivery increasing, warehouse use has been trending away from manufacturing and moving towards distribution. This creates requirements for space with clear heights of 32 feet and above. Well located, quality construction is commanding low $7.00’s NNN and sale cap rates have compressed to 6.0% for comparable product.